There’s been a lot of talk this year about the Mayan apocalypse, due to take place tomorrow—December 21. Whatever happens, I figure I’m pretty much at ground zero for it: I live in Mexico’s Yucatan Peninsula, home to the Mayans. Around here, folks mostly view the event as a spiritual rebirth. (Well, wouldn’t you? Much better than thinking we’ll all go up in a puff of smoke.) They see it as an opportunity to celebrate Mexico’s rich indigenous heritage. Festivals are scheduled all over the Peninsula, and expats with a connection to this region are winging home… to Cancun, Tulum, Merida, and elsewhere… to be here for the big day. According to some Mayan beliefs, the Aztec feathered serpent-god, Quetzalcoatl, left Teotihuacan, near Mexico City, to cross the Gulf of Mexico. He landed in the Yucatan Peninsula and traveled to Chichen Itza. There he became the serpent-god Kukulkan (he of the Great Pyramid in Chichen Itza, where every equinox you can watch the shadow of a great snake slither down the stairs). We figure that Quetzalcoatl came ashore on the Peninsula at—you guessed it—pretty much where Campeche is located today. A ceremonial torch is already lighted and on its way to Campeche from Mexico City. If my alarm clock works, I’ll be joining other celebrants for the start of the festival, at 5.30 a.m. We’ll walk silently through the heart of Campeche’s old center, from the Sea Gate, where the Gulf waters once lapped the city walls, to the Land Gate, five blocks away. It will be a melding of cultures and traditions. As we walk, we’ll come through a flagstone street, passing by 18th- and 19th-century Spanish-colonial buildings. Once stately homes, today most of them house clothing boutiques, hotels, tourist shops, and restaurants. Christmas decorations are already up here… a decorated tree in one new restaurant, frosted holly on shop windows… and down the middle of the street, strung from wire at the second-story level, marches a row of gaily-colored pinatas, that most Mexican of Christmas symbols. 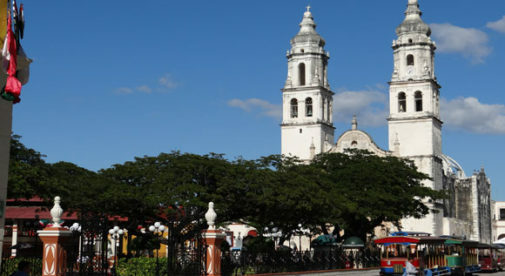 After that, the action moves to Campeche’s pretty main square, with its tall, leafy trees and central gazebo. There we’ll see costumed dancers perform Aztec and Mayan dances, hear music, singing, chanting, and more. Shamans from half-a-dozen countries will take part. I may not last through the entire event—it ends at 5.00 p.m., so a long day… But I do want to see as much as I can. When the sun rises on December 22 I expect all of us in Campeche will still be here… just in time to gear up for Christmas.